Marines Shirt [marines] - $12.00 : Tightwad Tees , Screen printing, embroidery, and design services with no minimums and unbelievable pricing!! 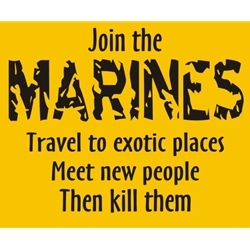 Many garment and color options available with lettering on front that says, "Join the Marines. Travel to exotic places. Meet new people. Then kill them." Inspired by the movie classic, "Full Metal Jacket", the Marines Shirt isn't just for Marines anymore. Just don't go wearing it around town pretending you're one of them. Seriously.